Thanks to “The Arabic original of (ps.) Māshā’allāh’s Liber de orbe: its date and authorship” (British Journal for the History of Science 48.2 (June 2015), p. 321-352) by Taro Mimura, associate professor at Hiroshima University, Japan, new information is available about LJS 439, formerly cataloged as an unidentified 14th-century cosmological treatise. 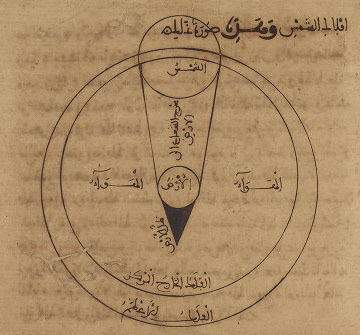 Using the digital facsimile of LJS 439, Dr. Mimura was able to identify this manuscript as one of two known copies of the 10th-century Arabic original of the Book on the Configuration of the Orb. The other copy is Berlin, Staatsbibliothek zu Berlin, Ms. or. oct. 273. The Arabic work was previously known only through Maimonides’s use of an example from it and through Latin translations. Dr. Mimura attributes the text to Dunash ibn Tamim, a student of Fatimid court physician and philosopher Isaac Israeli, and he is preparing an edition of the Arabic Liber de orbe based on these two manuscripts. Categories: Manuscript Research, Medieval | Tags: LJS439 | Permalink.